Thesis title: "Approaches to Counterpoint"
* The Passing of October, Op. 89. Paskke String Quartet . Shrine of Our Lady of Grace at Marylake. King City, Ontario. 4 October 2015. * Where the Dragonflies Swoon, Op. 92. Orillia Wind Ensemble (Louie Madrid Calleja, conductor; Erika Broughton, solo flute). St. Paul's United Church. Orillia, Ontario. 1 June 2013. * Gethsemane, Op. 85. Band and Bugles of the Queen's Own Rifles of Canada(Louie Madrid Calleja, conductor; Suraj Rajkumar, solo trumpet). Maurice Cody Hall, St. Paul's Anglican Church. Toronto. 4 May 2013. * Ave Maria, Op. 74a. Puellae Orantes Cathedral Girls Choir of Tarnow (Fr. Wladyslaw Pachota, conductor; Aleksandra Topor, soprano; Airis String Quartet). Nowy Wisnicz Castle. Poland. 6 September 2012. * Anthem ("Cheer Loud, Cheer Proud for Jarvis! "), Op. 84. Words by Max Barkley. Jarvis Collegiate Institute Band and Choir (Anita Kwok, conductor). Jarvis Collegiate Institute. Toronto. 26 May 2007. * Scherzo, Op. 83. Northdale Concert Band (Stephen Chenette, conductor). St. Jude's United Church. Toronto. 3 December 2006. * In Memoriam, Op. 81. Northdale Concert Band (Gillian McKay, conductor). St. Jude's United Church. Toronto. 9 April 2006. * Message in Scarlet, Op. 80. Hart House Symphonic Band (Keith Reid, conductor). The Great Hall, Hart House (University of Toronto). Toronto. 25 March 2006. * Somnium Diabolicum: Images from a Nightmare, Op. 79. Northdale Concert Band (Stephen Chenette, conductor). St. Jude's Anglican Church. Toronto. 12 December 2004. * A Choral Sonatina, Op. 48a. Esprit Alliance Orchestra (Louie Madrid Calleja, conductor); Coro San Marco. "Laudate Dominum." St. Catherine of Siena Roman Catholic Church, Mississauga, Ontario, Canada. 29 November 2003. * Maybe, Op. 78. Louie Madrid Calleja, flute; Myung-Sook (Cecilia) Song, piano. York Woods Library Theatre, Toronto, Ontario, Canada. 27 November 2003. * "Lux Aeterna" from Requiem, Op. 37. Esprit Alliance Orchestra; Michael Nasato, tenor; Louie Madrid Calleja, conductor."Resurrection." Church of the Transfiguration, Toronto, Ontario, Canada. 12 April 2003. * Passacaglia, Op. 72. Northdale Concert Band (Stephen Chenette, conductor). Scarborough Civic Centre. 7 April 2002. * Allegro Barbaro, Op. 68. Continuum Contemporary Music Ensemble. York University, 2001. * Salve Regina, Op. 48 (1995 version). Northdale Concert Band (Stephen Chenette, conductor); Measha Brueggergosman (nèe Gosman). Scarborough Civic Centre. Toronto, Ontario, Canada. 1995. * Soliloquy for Band, Op. 40. York University Wind Symphony (Troy Thrower, conductor). Toronto, Ontario, Canada. 1994. * Ave Maria, Op. 74a. "Ave Maria." Puellae Orantes Cathedral Girls Choir (Tarnow, Poland); Fr. Wladyslaw Pachota, conductor. 2012. * In Memoriam, Op. 81. "North Winds III." University of Manitoba Concert Band; Dr. Fraser Linklater, conductor. 2011. "Certain keys, tonalities, and melodic formulas fortify the human character; others may weaken it. Musical training is a more potent instrument than any other, because rhythm and harmony find their way into the secret places of the soul." * Passacaglia, Op. 72. 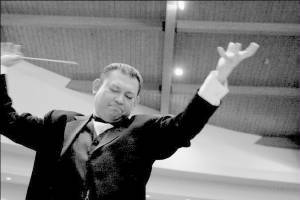 Festival Wind Orchestra (Louie Madrid Calleja, conductor). Betty Oliphant Theatre. Toronto. 15 December 2012. * Message in Scarlet, Op. 80. Silverthorn Symphonic Winds and the massed band of the Canadian Band Association Ontario Chapter (Louie Madrid Calleja, conductor). Richmond Hill Centre for the Performing Arts. Richmond Hill. 14 October 2012. * Scherzo, Op. 83. Festival Wind Orchestra (Keith Reid, conductor). Betty Oliphant Theatre. Toronto. 17 June 2012. * Scherzo, Op. 83. Canadian Band Association (Ontario) Weekend. Orillia Wind Ensemble (Louie Madrid Calleja, conductor). Orillia Opera House. Orillia. 16 October 2011. * In Memoriam, Op. 81. Northdale Concert Band (David Bourque, conductor). Sunnybrook Hospital K-Wing. Toronto. 17 April 2011. * Message in Scarlet, Op. 80. Festival Wind Orchestra (Keith Reid, conductor). Betty Oliphant Theatre. Toronto. 11 December 2010. - (Gennady Gefter, conductor). Fairview Library Theatre. Toronto. 16 June 2009. * Scherzo, Op. 83. The Regimental Band and Bugles of the Queen's Own Rifles of Canada (Capt. Rita Arendz; DoM, CD). Cody Hall, St. Paul's Anglican Church. Toronto. 24 April 2009. * Overture for Saxophone Quartet, Op. 51. Sax Ensemble of the Silverthon Symphonic Winds. First Unitarian Congregation of Toronto. Toronto. 21 June 2009. * Message in Scarlet, Op. 80. 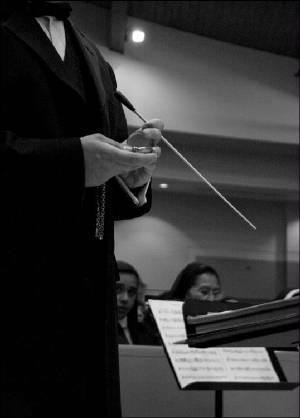 North York Concert Band (John Lyttle, conductor). Al Green Theatre, Mile Nadal Jewish Community Centre. Toronto. 26 May 2007. - Silverthorn Symphonic Winds (Louie Madrid Calleja, primary interim conductor). Silverthorn Legion. Toronto. 29 April 2007. - Northdale Concert Band (Stephen Chenette, conductor). Hope United Church. Toronto. 25 March 2006. * Passacaglia, Op. 72. The Regimental Band and Bugles of the Queen's Own Rifles of Canada (Capt. Rita Arendz; DoM, CD). St. Paul's Anglican Church. Toronto. 20 April 2007. - Northdale Concert Band (Stephen Chenette, conductor). St. Jude's Anglican Church, Toronto. 15 May 2004. * Scherzo, Op. 83. York University Wind Symphony (William Thomas, conductor). Accolade East, York University. Toronto. 1 April 2007. - Volga Concert Band. Saratov, Russia. 28 March 2007. * A Choral Sonatina, Op. 48a. Esprit Alliance Orchestra (Louie Madrid Calleja, conductor); Coro San Marco. Concert entitled "Glory to God" with the Esprit Alliance Orchestra, Coro San Marco. St. Catherine of Siena Roman Catholic Church, Mississauga. 27 November 2004. - Esprit Alliance Orchestra (Louie Madrid Calleja, conductor); Coro San Marco. "Memories of Christmas Past" A Tribute to Maestro Pietro Drago. York Woods Library Theatre, Toronto, Ontario, Canada. 6 December 2003. "Lux Aeterna" from Requiem, Op. 37. Esprit Alliance Orchestra; Michael Nasato, tenor; Louie Madrid Calleja, conductor. "Memories of Christmas Past" A Tribute to Maestro Pietro Drago. York Woods Library Theatre, Toronto, Ontario, Canada. 6 December 2003. * Ancient Rhapsody, Op. 52. Louie Madrid Calleja, flute; Myung-Sook (Cecilia) Song, piano. York Woods Library Theatre, Toronto, Ontario, Canada. 20 November 2003.